And get your business noticed by the perfect audience looking for goods and services related to the baby, toddler and child market. 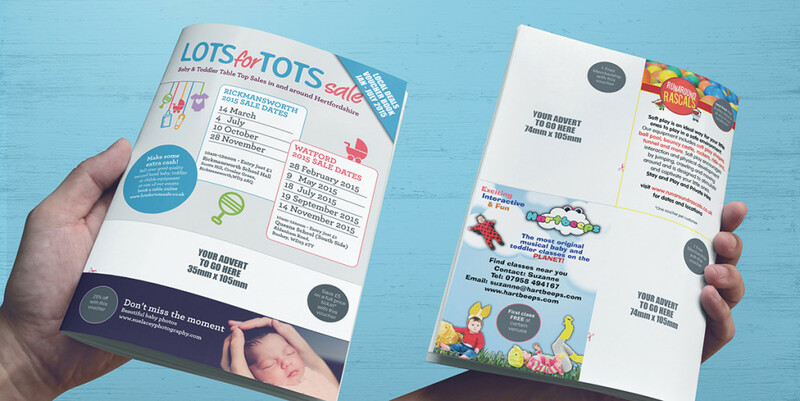 Our voucher books are 4 page, A5 booklets with advertising spaces for your company that get distributed at our sales. By advertising in a voucherbook you get to save the cost of single print and distribution and customers love the added value they offer. To feature in a voucherbook you must be willing to offer some kind of discount, trial or offer. This can be whatever you want it to be! It’s a great way of giving customers an extra incentive to use your business or service and it also means you can measure how successful the advertising is for you. • The estimate hand out for 6 events is 2.5k & the total print run would be 5k and we will distribute remaining leaflets to local child / baby related centres in the area. Each voucher book runs for 6 events across our Watford and Rickmansworth locations, where the booklets are given to every customer by hand as they enter. Contact info@lotsfortotssale.co.uk if you would like to secure a space or for more information.